The Zapotec arrived in the valley of Oaxaca in central Mexico by at least 500 B.C. and maintained their capital at Monte Albán until approximately A.D. 900. Despite evidence of extensive trade with other Mesoamericans, the Zapotec remained independent and developed their own writing system and artistic traditions. One typical Zapotec form is the cylindrical vessel with an effigy figure attached to the front. Placed in tombs and other architectural settings, these ceramic urns have been found empty for the most part; a few contained precious offerings of obsidian knives, green beads, and shells. 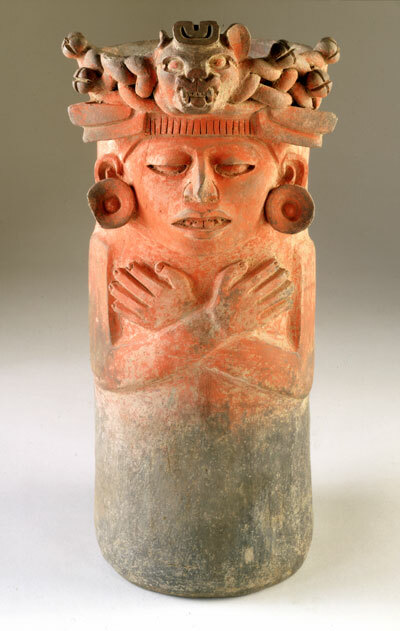 On this early example the figure wears a simple headdress of bells, woven cloth, and a small jaguar's head. Later urns are completely obscured by the effigy's elaborate ornamentation, mask, and headdress. While the exact significance of the urns remains unknown, their figures have been identified as deities or perhaps humans wearing the accoutrements of the gods and acting as intermediaries between the human and divine worlds.